Apparently, I had know idea that this film existed until I found it on Amazon the other day looking for Halloween craft books. 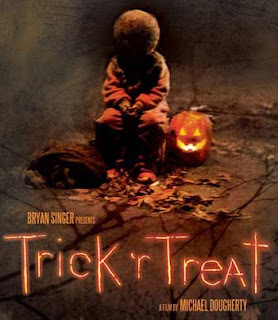 Bryan Singer produces, Anna Paquin and Brian Cox star in Michael Dougherty's "Trick R' Treat." First released in 2007, the film is finally, two years later, coming to DVD October 6, 2009. Trailer below. The imagery in the trailer alone is enough to get ridiculously excited about. And the film has the amazing Anna Paquin of HBO's True Blood and an army of fan reviews claiming this to be the next big cult classic. All I can do is pray that I'm not disappointed and wait for October 6 to come. And there's also a production book with similarly glowing reviews. "The usually boisterous traditions of Halloween turn baleful, and everyone in a small town tries to survive one night in pure hell in writer-director Michael Dougherty's fright fest. Several stories weave together, such as a loner fending off a demented trick-or-treater's attacks, kids uncovering a freaky secret, a school principal -- who moonlights as a serial killer -- poisoning his candy, and more. Dylan Baker, Anna Paquin and Brian Cox star."